Manchester United forward Anthony Martial wants to leave the club this summer, according to his agent, who said the "time has come" to move on. Philippe Lamboley claims United want to extend Martial's deal - and BBC Sport understands the club do not want the Frenchman to leave Old Trafford. Lamboley said: "We have not reached an agreement for several months." Martial, 22, had his first-team opportunities limited by the arrival of Alexis Sanchez in January. Martial scored 11 goals in 45 appearances last season but failed to make the France World Cup squad. He has a year left on his contract, and United have the option to extend by another season. 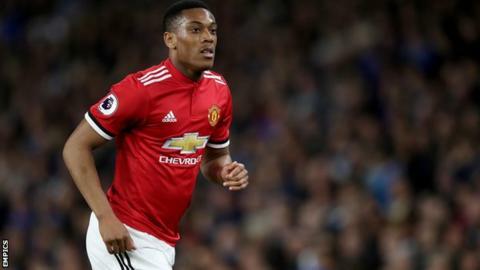 Tottenham are known to be keen on Martial, although they have not made a bid for the former Monaco striker, who cost United £36m in September 2015. Lamboley said Martial was "disappointed because he has shown his love for the club and the supporters for three seasons". "After thinking about all the factors and possibilities, Anthony wants to leave Manchester United," Lamboley told French news outlet RMC Sport. "There are lots of factors, and right now it's too early to talk about them. "I think that when United, the most powerful club in the world, do not find an agreement after eight months of negotiations then they do not really want to keep such an important player in their squad. That's why this decision has come - it's a well-thought-out decision. "Everyone will have their opinion but I think he needs to resume his career. The time has come." Martial has won the EFL Cup, FA Cup and Europa League with United.